At the recent “Celebrations Meeting” of the Rotary Club of Lahaina Sunset three students were recognized as recipients of scholarship awards. Two students each received the $2500 “Go for the Green” Scholarships. These scholarships were presented to the selected students who will be attending an accredited college and must be pursuing a field of study that will benefit the environment. Caele Manley from Molokai High School and Ruby O’Donnell from Lahainaluna High School were the recipients of the “Go for the Green” scholarships. Caele will be attending Wheaton College in Wheaton, Illinois will be studying Engineering while competing in collegiate wrestling. Ruby will be attending Oregon State University and will be studying Sustainability and Business Administration. Both recipients have indicated that they wish to return to their island home to pursue their careers after earning their collegiate degrees. Macaleigh Hendricks from Kihei Charter High School was the recipient of the club’s Hawaii Rotary Youth Foundation (HRYF) $5000 scholarship. HRYF is a non-profit charitable organization whose main objective is to provide scholarships for Hawaii youth to further their education after high school. Each of the 51 Rotary Clubs in District 5000 were able to select a scholarship recipient for this $5000 award. Macaleigh will be studying abroad in Rome, Italy at John Cabot University this fall, and will be attending the University of Southern California to study entrepreneurship, environmental studies, and film production in the spring. 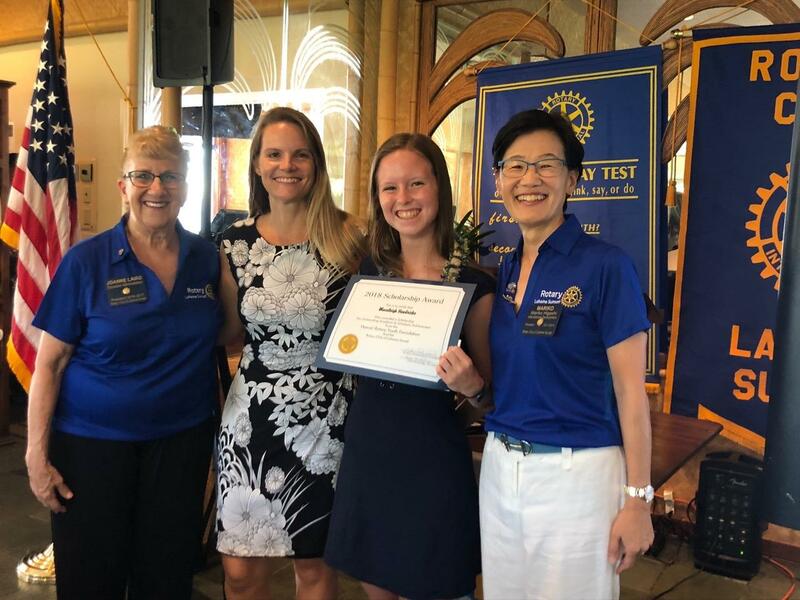 Photo ID: Macaleigh Hendricks (3rdfrom left) receives the HRYF Scholarship certificate at a recent meeting of the Rotary Club of Lahaina Sunset. Pictured (L-R) are Joanne Laird, Co-President, Michelle Hendricks, Macaleigh Hendricks, and Mariko Higashi, Co-President.